You are here: HomenextTopicsnextViews of the city: images & opinionsnextMystery photos of Brighton and HovenextDo you recognise this shop? Does anyone know where this shop was? The photograph was taken before 1947. Please leave a comment below if you can help. Many thanks. I am sure this photo is 85 Portland Road, Hove. The shop next door is most likely what was Sadlers the Chemist. F.W. Sadler was a minister at the Stoneham Road Baptist Church. The shop looks like it was in Portland Road and I went to Stoneham Road Baptist church. I am only 28 years old but I have been told all about the Sadlers. 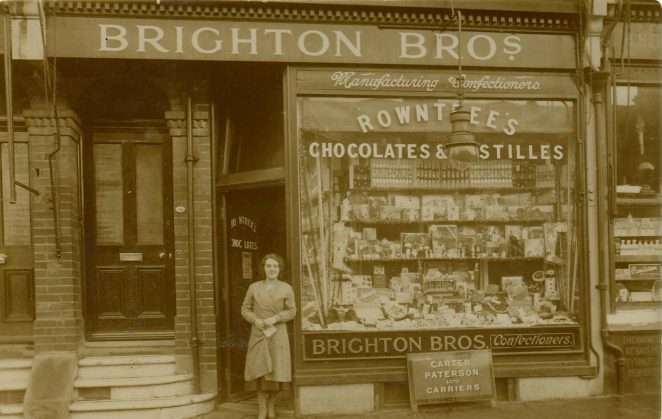 Brighton Brothers, confectioners, Davigdor Road; 85 Portland Road, Hove; 107 Western Road, Hove & 7 George Street. In the Street Directory section, page 83, Davigdor Road all at the same address: 99A Greycoat Press Ltd. (The), printers; Bassett T. W. builder; Hall & Co. Ltd. coal merchants; Brighton Brothers, wholeslae confectioners; Cripps Richard Augustus F.I.C. analytical chemist & public analyst to the Borough of Bournemouth (laboratory); Cripps R. A. & Son, wholesale chemists; Langton Limited, motor engineers (Wick motor works); National Association of cycle & Motor Cycle Traders Ltd; Hove Engineering Works (William Hawker proprietor); Whitbred & Co. lim. wine & spirit merchants (general offices); Field & Cox, builders (works); Austin Wm. Hy. (The Cottage); Hanningtons Ltd. furniture depositories. 83 Sadler F.W. & son pharmacists; Sadler, John Kenneth; 85 Brighton geo. Fredk; 85 Brighton Bros. confctnrs; 87 Star Laundry Co. Ltd. (receiving office). 106 Swift & Presswell Ltd. dyers & cleaners; 107 Brighton Bros., confrs; 108 Flatman Frederick John M.P.S. dispensing chemist Telephone No. Hove 4163. 6 Foreman Alex. D. photographer; 6 Waller Miss Sylvia photographer; 7 Brighton Brothers wholesale confectnrs; 8 British & Argentine Meat Co. Ltd. Butchrs. Obviously these entries only refer to the approximate time period but they may mean that the shop was either 85 Portland Road, or 107 Western Road – as both these had chemist shops next door. I hope that helps a bit. In the 1950s Brighton Brothers were still operating at 119 Davigdor Road. Next door at 117 was Wilkes the chemists, and also a private dwelling at the same number as Brighton Brothers. So this could be the premises. I am almost certain it is Portland Road, Hove, next door to old Mr Sadler the chemist of Stoneham Road Baptist Church. Peter Brighton has only recentlly died. He, together with his brother Eric, were the sons of Mr Brighton Snr., and were members of Holland Road Baptist Church and sang in the choir in the 1940’s. I am sure this is Portland Road in Hove. I believe Mrs Sadler was a supply techer who came to teach us at the Knoll Girls School before it separated from the Boys School next door, in Old Shoreham Road. A few doors away from Sadlers, was a confectionists where my Gran would buy me either a Fry’s Five Boys bar of chocolate or a green ice lolly, depending on the time of year. This would have been in the mid 1950s for the sweet shop but early 1960s for the Knoll School. This is definitely 85 Portland Road, Hove. My father, John Caperon, recognised the shop as he worked next door as a dispenser for Mr Sadler the pharmacist. My mother can remember buying sweets in the shop when she was a child. I have clothes hanger with the company Swift and Presswell Ltd. It states it’s head office is London W3. I believe Brighton Brothers had a sweet factory in Davigdor Road. One of the brothers ran our Boys Brigade outfit – the 18th based at Holland Road Baptist church. My first job after leaving school was storeman at Brighton Brothers (now Wholesellers), therefore I know they still existed at 119 Davigdor in the mid 60s as well as the on site sweet factory managed by a Mr Bill Large. I can still remember his “Old Bil’ls Specials”. Far as I can remember, there was a car repair workshop next door. If anyone has any more photos or information about the shop in the picture or Brighton Bros please post here or forward to me. The shop was part of Brighton Bros established by my great grandfather James Brighton and one of his brothers Bert back in 1905 so any stories, history or memorabilia would be very interesting and appreciated. I have recently been given a copy of the above photo. My dad Basil Brighton was part of the family company & I am sure I can remember visiting my Grandparents George & Flo Brighton through the door to the left of the shop, which was their home. My ex-husband was a delivery driver at the wholesalers in the early 70’s – Glen Clamp. Anyone remember him? When this picture popped up on my screen I thought briefly that I was looking at the hardware shop in Portland Road, Hove, which has recently changed hands. Most of those shops on the north side haven’t changed much at all, and I’m sure that particular front door and steps to the flat looks just the same as the day it was built (1900’s?). One of the Brighton Bros also ran the Sea Scouts?/Cubs at the Holland Road Church. Of course he also always brought some of his sweets to our meetings. They were a really nice pair of chaps! Their only desire was to do good. I think it’s whats now the laundrette in Portland Road, I’ve checked and the stairs are identical, the brickwork is identical as are the mouldings on the brickwork at the top. The semi-circle window is also the same. Most of these buildings would be unrecognizable now due to having gaudy modern fronts and PVC windows and doors. All of this parade must have been identical (the two to the left, including the locksmiths, still have their original fronts) but the number of steps leading up to the door seems to vary on each one; the locksmiths having two, this one having three as in the picture and the laundrette today. I concur with Robert Bovington. I used to know a Mr. Brighton who had a sweet factory in Davigdor Road Hove and was the leader of the Boys Brigade group of which I was a member at the Holland Road Baptist Church in the early 1970’s. He used to live in a nice detached house on the corner of Old Shoreham Road & Montefiore Road, or was it Avondale Road? At any rate a very nice & cultivated gentleman of whom I have only good memories. I used to go to lifeboys at Holland Road Baptist Church at the age of nine years and it was run by Brighton Brothers then. I never knew if the two gentlemen who were in charge were really brothers or not. I remember Mr Large, my mother worked in the factory, I was young at the time and was at Davigdor Infants school. I was looking to see if the company was still in business, clearly not. Think they had a brand called Hovena, could be wrong, 50 yrs ago I’m thinking back. Kings Cuts, Hair Shop and Barbers, now occupies these premises at No 85 Portland Road, Hove. (The launderette is at No 93).